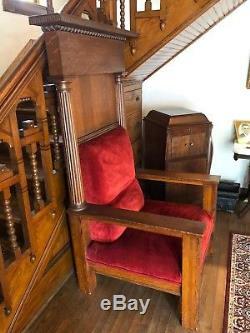 Large, spectacular and regal antique Arts & Crafts/Mission Style throne chair made of solid quarter-sawn white (tiger) oak with fluted columns and egg & dart crown pediment. 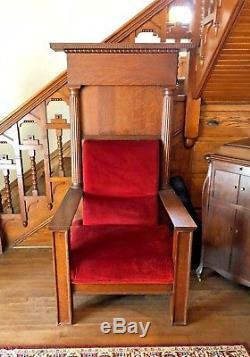 Measures 5ft 9in tall and 40 1/4in wide at it's crest; Arms measure 34in wide with an inside (seat width) of 23 3/4in. 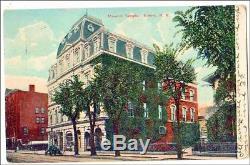 Dates to the late 19th century to very early 20th century (circa 1900) and was originally from the old mason's lodge in Elmira, NY. Very solid & heavy guessing close to 100lbs! 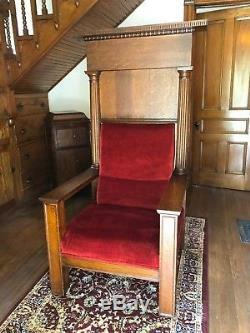 With original antique finish and very nice, newer scarlet velvet upholstery. 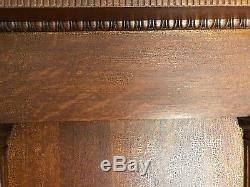 Age related wear & tear with shellac crackeleur adds character! And some minor scuffs & dings. 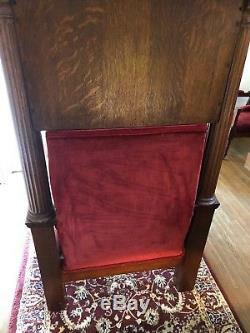 Overall, this chair is in very nice condition and has been very well taken care of over the past 100+ years. 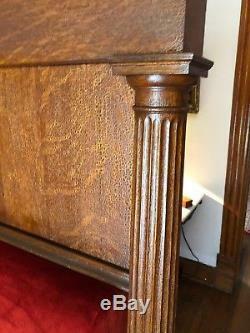 Amazing craftsmanship from a bygone era. 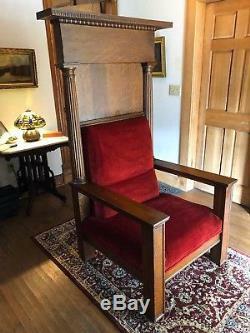 This chair really makes a statement and is truly fit for a king or queen! All that's missing is you, your crown and perhaps your favorite beverage! Would be a fine addition to any historic home. Please feel free to message us with any questions you may have. 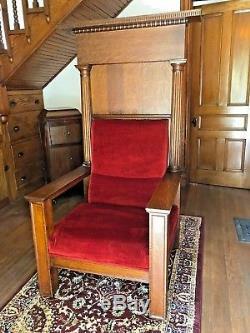 The item "Spectacular Rare Antique Mason's Throne Chair Tiger Oak C1900 Fit For A King" is in sale since Thursday, October 4, 2018. This item is in the category "Antiques\Furniture\Chairs\1900-1950". The seller is "hobbitpatch" and is located in Corning, New York. This item can't be shipped, the buyer must pick up the item.